The FIFTH year of the Holiday Book Tree - THANK YOU! We are grateful to all for a wonderful holiday season AND for the many books dedicated on the fifth year of the Holiday Book Tree raising a total of $2583 - our highest total ever. Thanks to you, $1,291,50 (half) will be sent to DIRECT RELIEF.org for much needed Puerto Rico & US Virgin Islands hurricane relief. 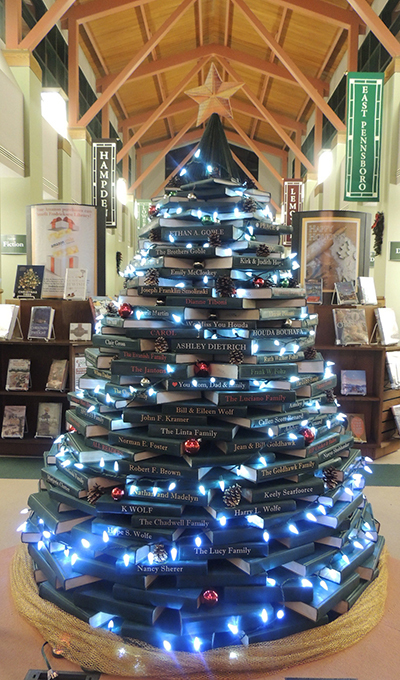 Thank you to all for your dedications, sharing your stories about the folks you were honoring and warm holiday wishes.Stop in and see the 2017 Fredricksen Library Book Tree over the Holidays! LIBRARIES - DOWNLOAD A STEP-BY-STEP INSTRUCTION BOOKLET HERE TO REPLICATE AT YOUR LIBRARY! 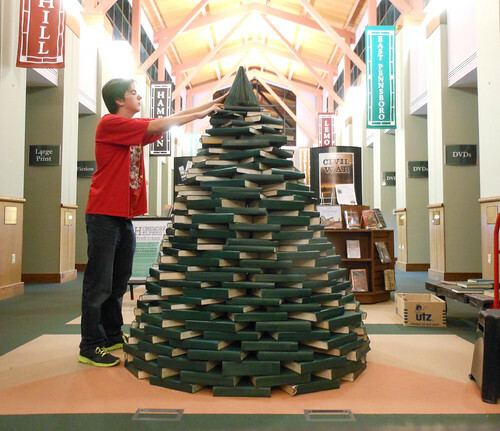 Help celebrate the fifth year of the Holiday Book Tree with your participation! 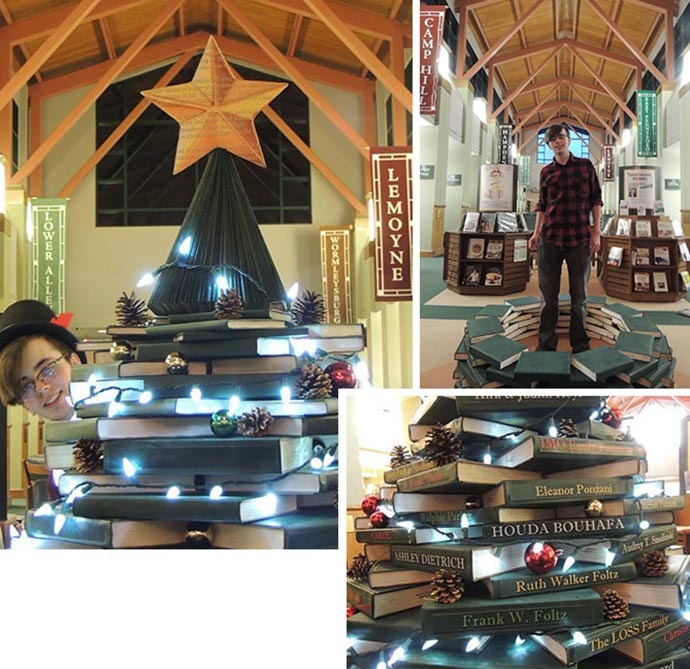 Created entirely from withdrawn books, the 6 ft. tree is a volunteer project by Joseph F. Smolinski and an annual fundraiser. What a wonderful way to honor your family or loved one, and this year, your donations will support Fredricksen Library AND hurricane relief. For a donation in the amount you choose (minimum $10), patrons can have a name or family name placed on the spine of a book for the 2017 holiday season. Dedications available NOW through December 20. Holiday cards will be available at the library for you to send to the recognized person or family if desired. And watch for YOUR dedications on facebook and instagram. Forms will be available at the Reference and Circulation Desks, OR make your dedication request ONLINE NOW! THIS YEAR, HALF OF YOUR GENEROUS DONATIONS WILL GO TO HURRICANE RELIEF IN PUERTO RICO & THE U.S. VIRGIN ISLANDS. Please give all you can so we can meet our goal at Fredricksen AND help the hurricane devastated areas. UPDATE: Thanks to all your generous donations - the FIVE YEAR TOTAL just passed $10,000! Thank you for participating in this annual tradition at Fredricksen and your continuing support!